Most parents think of SPF, or Sun Protection Factor, as a way to tell how strong a sunscreen is. And while that is somewhat true, as an SPF 30 sunscreen provides more sun protection than an SPF 15 sunscreen, there is more to it than that. For one thing, SPF is only a measure of a sunscreen's effectiveness against UVB rays. So your child might have poor sun protection, even if you're are using a high SPF 100+ sunscreen unless it also lists sunscreen ingredients that block UVA rays. These sunscreens that protect against UVA and UVB rays are usually labeled as broad-spectrum sunscreens. Another misconception about SPF is that it simply tells you how long you can stay in the sun without getting a sunburn. While that is true, how much a sunscreen protects you -- no matter the SPF -- also depends on the intensity of the sun at the time. For example, it might take 30 minutes for a child without sunscreen to get a sunburn in the morning, but only 15 minutes in the early afternoon, when the intensity of the sun's rays are higher. And even at the same time of day, it will take less time to get a sunburn on days when the UV index is at a moderate to high level, versus days when it is low. So while an SPF 15 sunscreen will theoretically allow your child to stay in the sun 15 times longer without getting a sunburn than he would with without sun protection, depending on the time of day and the UV Index, that may mean 4 hours or 8 hours of sun protection. Would an SPF 50 sunscreen allow your child to stay in the sun 50 times longer, providing all day protection? And many parents only use about one-fourth to half the recommended amount of sunscreen and don't reapply it often enough. Many experts question whether using a sunscreen above SPF 30 is really necessary, though, since you are already blocking 97% of UVB rays. 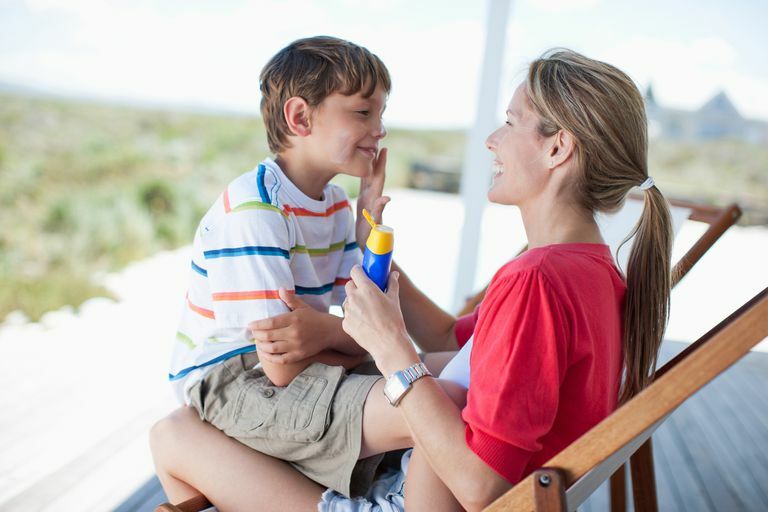 Using a high SPF sunscreen might be a good idea and could provide more protection for those parents who don't use enough sunscreen and don't reapply it often enough. For example, an SPF 30 sunscreen will effectively become an SPF 5 sunscreen if you only apply half the recommend amount, as many parents do. If a high SPF 100 sunscreen decreases by the same amount, then hopefully you are still in the SPF 15 to SPF 30 range of SPF protection. If your child is still getting tanned or even sunburned, despite the use of sunscreen, be sure to apply it sooner, before your child goes outside, apply much more (consider using 2 to 4 times more sunscreen), reapply it much more often, and consider using a high SPF sunscreen (SPF 100+) that is very water-resistant and offers broad-spectrum UVA and UVB protection. Auerbach: Wilderness Medicine, 5th ed. CDC. Skin Cancer Prevention April 2010. FDA. Sunburn Protection Factor (SPF). April 2009. Kim SM. The relation between the amount of sunscreen applied and the sun protection factor in Asian skin. J Am Acad Dermatol - 01-FEB-2010; 62(2): 218-22.